Outside my window... Snow Day No School… It is Friday and that snow has came again. It is amazing to me that in my last 3 daybooks I have written in, snow has arrived on Friday. I am thinking... I have to make this quick. Being that it is a snow day, the kids are home and we are going to get our laundry caught up. They are asking for a WII chore challenge so I cannot deny them. I am thankful... to god for my family, friends and home. In the kitchen... Yesterday my husband looked on my blog at our menu plan for the week and found out that we were having chicken Alfredo and cooked it. He pressure cooked the chicken and then grilled it. It was delicious even though he used chicken helper to make it. This weekend I want to make something using the puree carrots I made from leftover carrots the other night. I am thinking some muffins or something sound yummy. I am creating... This post and then I am off to start working on the house while the kids are in the mood. We have 23 days until the construction begins. I am going... to have another busy week as I have paper work to get caught up on. I need to stop reading blog posts and getting side tracked on this for awhile so I can get something accomplished. I am reading...Nothing aside from Blogs. Honestly, my husband asked, “Don’t you have a book review you have to post soon?” I have still not updated the kids book challenge to show the books we have read so far this year. I am hoping...for a nice weekend with my husband even if we have to stay home. He had a little problem keeping his call in dates straight and so we are waiting on a check. Hope the internet does not get shut off while we are waiting. I am looking forward to... chicken salad sandwiches my husband is planning on making tomorrow. Yummy, He kept some of the chicken he pressure cooked and is planning on buying walnuts, grapes and croissants to go with it. I love to dip tortilla chips in coleslaw and eat them with it. Anyone have a good coleslaw recipe to share that uses horseradish type flavor? I am learning that I need to work on making a list of things to do each day and trying to work on accomplishing them. I have been slacking since before my surgery really. Around the house...well, this one goes with the above one. We have much spring cleaning to do around here. I would love to get to the basement and go through all my books but first we have just gone through kids clothes again and slimmed down on the amount we had. I am pondering... rather I should cut sierras bangs or not. I try to keep it up and she pulls the pony out. When I let her have the short bangs it just made it so she had hair in her eyes no matter what. Grandma came last night and gave haircuts again. We were behind for having a MIL who owns a beauty shop. I had her cut a few inches off mine too as it was frizzy on the ends. I am going to get some hot oil treatment I think to try to cut down on the frizz. Frizz is something that seems to go with my curly hair. We cut a lot of hair off Matthew and it is looking cute. The curl did not go away on him either. A favorite quote for today... Why put off today what you can do tomorrow. Lol, that one is funny. 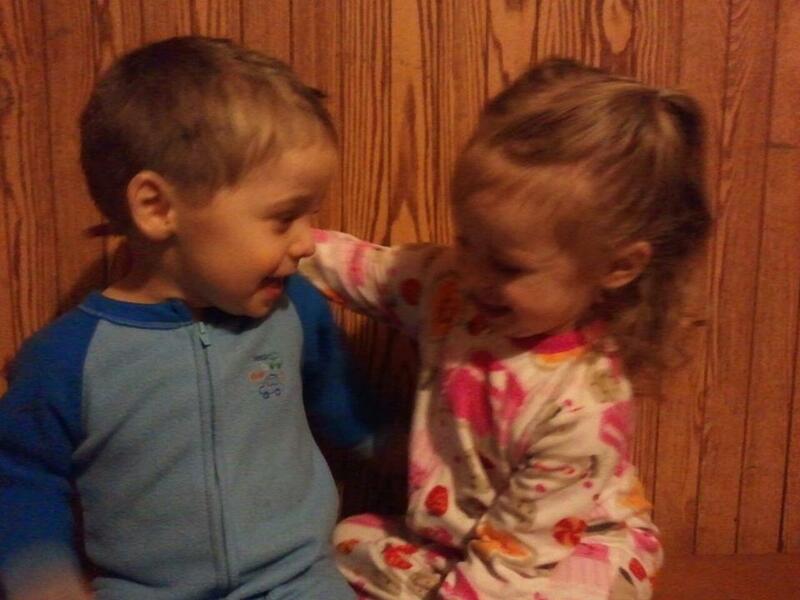 One of my favorite things... is when my kids get along on a snow day… you know that is a joke right! A few plans for the rest of the week: Look at the plans for the week from last week and get caught up on them. A peek into my day... after bath last night ready to cuddle. When i get time I am going to add the pictures of the other kids hair cuts as well.